Brought to you by the chocolatiers of Kohler Original Recipe Chocolates, this chocolate of the month club is available in three, six and 12-month subscriptions. Each month a different Kohler specialty selection will be delivered. With their competitive price, it is an affordable chocolate of the month club to give yourself or to someone else. A monthly chocolate club that is provided by a well-known and respected chocolate brand. With the Kohler Chocolate of the Month Club members are restricted to Kohler brands of chocolates, but each month there is still something different shipped out. Chocolates include milk, dark and white varieties and can be everything from fruit-filled to seasonal to peanut butter and even trail mixes made with Kohler signature candies. They do not necessarily offer any super fun or unique chocolate selections, but they still are great about ensuring members do not repeat on monthly deliveries. 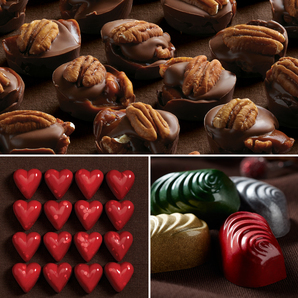 Monthly subscriptions are selected by Kohler’s in-house chocolatiers and often follow their in-store specials. Just some of the more interesting items include eggs and peanut butter bars delivered around Easter, Holiday chocolates in December, and their Raspberry Garden Ganache and Cherry Almond Bars for May. The Kohler brand is known for their exceptional quality. Started by Herb Kohler, the company employs chocolatiers and chefs from The American Club to create their chocolates and meet the owner’s very strict demands for the best, highest quality possible. The company strives to explore limitless tastes and honor every ingredient used. While they may only be domestic varieties of chocolate, they import their varieties of chocolate from around the world to ensure maximum taste and texture. The company itself is very refined in its recipes and there is no doubt about the quality of their products. There is one core membership with three options: three month, six month and 12-month contracts. Like most clubs, Kohler Chocolate of the Month Club does require a commitment, but three months is very short. The prices vary from $80 to $275 – but these are highly competitive with other chocolate of the month clubs. The only hitch is that each shipment does not contain a pound of chocolate like most clubs; therefore, some months members may feel they are not getting much chocolate for the price. The best value, obviously, is in the annual membership where members can spread the selections out more. Each shipment is based on a pre-determined shipping calendar. The shipments do not come with any special highlights on the chocolatier, but sometimes include information about how the Kohler brand of chocolates came about. There are not many perks for being a member and to reorder something from a shipment, members will pay full price and shipping. Kohler Chocolate of the Month Club always ships in highly attractive packaging. They ship in order to maximize freshness and all orders are shipped at the beginning of the week to ensure the order does not sit over the weekend. Because their chocolates melt at 70 degrees, the company will use ice to ensure the quality of the chocolates being shipped to warmer climates. While shipping is included, the company often contacts customers and encourages them to upgrade to 2nd Day Air for the added fee. While they do this to ensure the best quality, some customers may find it inconvenient that they have to constantly reassess shipping. There is not a specific membership option through Kohler Chocolate of the Month Club for gifts. However, the three and six month chocolate club memberships would make ideal gifts. Unfortunately, the company does not include a gift message or letter when it is purchased as a gift. Overall, Kohler Chocolate of the Month Club is easy to navigate. The site is dedicated to the Kohler brand and just features a few pages on the club itself. Sign up is done through a checkout process and there are a few extra resources online – including a blog. Members can see what shipments they will receive when signing up and even select the month they wish to start – if there is something they prefer to start out with. There is limited support from the team at Kohler and any questions regarding their chocolate of the month club will be automatically directed to the main customer service line. They have a toll-free number, but hours are limited. Messages can be sent via a contact form and via email as well. Ground shipping is included on all memberships. Three Month Club: Includes three shipments of fine Kohler-brand chocolates. Starts at $80 for three months. Six Month Club: Includes six shipments of Kohler-brand chocolates. Starts at $150 for six months. 12 Month Club: Includes a full year of Kohler selections. Starts at $275 for the full year. Kohler Chocolate of the Month Club is probably best for those that already know and love the Kohler brand or are looking to stick to just one brand. Because they do not ship other types of chocolates, a year’s membership may be too limiting for some chocolate lovers. Price-wise some members may feel they are overpaying, especially on the months they don’t receive a full pound. For gifts, the three and six month memberships will work, but the 12-month may be too much. Overall, it is still a good club option for those that want great, high-quality chocolates delivered each month. Kohler Chocolate of the Month Club has a lot of good features and some room for improvement. We do love that their owner is chocolate-centric and opened his business with a simple goal of creating better chocolates. Kohler is a fine brand of chocolate, so you do know that you will always receive something that tastes excellent and is hand-crafted. However, it may be limiting to just stick to Kohler brands when other clubs often ship chocolates from around the country or around the world – increasing your exposure. We like that they offer free shipping – but we do not like that they frequently contact members to upgrade to higher-priced shipping. We do understand their reasons behind it, but to some memberships this may be more of a hassle than the club is worth. We wish that they gave members more chocolates too. Some months members may not feel as though they are getting much chocolate for the price – making this club unappealing to those that are more concerned with budget. Overall, it is still a great chocolate club for gifts or to indulge in for yourself. A chocolate club from a leading brand. Enjoy 12 months of Kohler original recipe chocolates delivered straight to your door. This club offers a specific shipment per month (pre-selected) at a flat price. Shipping is included, making it an affordable gift option too.